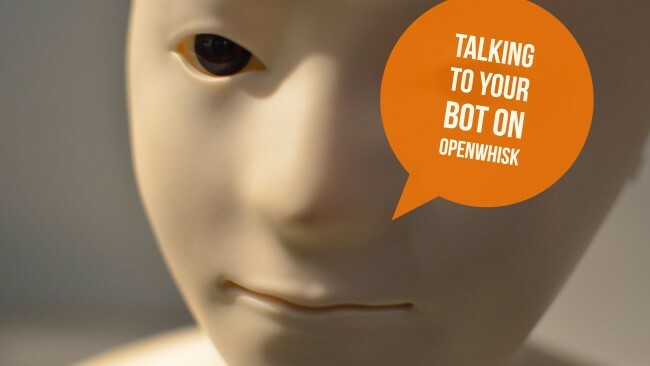 As I continue my look into serverless with OpenWhisk, today I thought I’d build a quick demo around an incredibly cool bot service I discovered a while ago called Pandorabots. I first played with their service last summer, and I thought it was cool as hell, but I never got around to actually writing up my experience with it. My original exploration of it was via ColdFusion, but I thought this would be a great example of something I could build even easier (and a heck of a lot quicker) in OpenWhisk. Pandorabots provides what it calls “AIaaS”, “AI as a Service”. Basically what this boils down to is the ability to process natural language input and handle responding intelligently based on rules you create. Their actual service is pretty simple. You’ve got APIs to upload scripts for your bots and APIs to ‘speak’ to your bot, the real complexity comes in at the AI level. There is no way I can adequately explain the full power of their bot service, so instead I’ll give you some high level points to describe what you can do. So the simplest, and most direct feature, is to simply say, “If I say hi, respond with Hello!”. That’s basic string matching and it’s not too exiting. But their service goes beyond this of course. You can define various aliases, so I can map hello, bonjour, etc. to the same response. It has built in spelling corrections and other fixes, so it will recognize “isn’t” as “is not” for example. It can automatically handle multiple sentences, parsing each one and creating a response to everything sent to it. It can do basic pattern matching, so given I said, “I like cookies”, I can train my bot to recognize “I like SOMETHING” and it will correctly pick up “cookies” as the thing I like. The bot can have variables with predefined values. So I can define a variable, botname, that defines the name of the bot, but the bot can also remember your name if you tell it and refer to that variable later. You can define arrays (called sets) and maps to train your bot to associate words or terms together in one unit. And this truly cool - it supports context. What that means is you can recognize that a response is based on a previous question. The examples the docs give is that if I say the word coffee, the bot could respond with “Do you like coffee?”. If I say just “yes”, my bot can recognize that we’re still talking about coffee. Yep, XML-based, but there’s nothing wrong with that, right? The Talk endpoint simply has me hitting: https://aiaas.pandorabots.com/talk/APP_ID/BOTNAME?user_key=USER_KEY&input=INPUT. You can also append a sessionid value that represents a talk ‘session’. When you send data to the bot, it returns a sessionid value automatically, but you need to pick that up and send it back. Let’s start with a simple OpenWhisk action. I think I love this bot. Honestly.